Curl up in front of a roaring fire with a cup of cocoa and enjoy the quiet side of the Island in November. Explore hiking trails, explore quaint shops, enjoy local events and feast at local restaurants featuring mouth-watering farm to table ingredients. Whether romance, quality family time or adventure you're seeking, you'll find it on Salt Spring Island! World Accordion & Tango Festival | Saturday 3rd | 6:00pm to 7:00pm | All Saints by-the-Sea Church: 110 Park Drive | $20-$25 | Some of the world’s best accordion performers are coming to Salt Spring Island for an exclusive concert! Jelena Milojevic (Canada), Jianan Tian (China) and Grayson Masefield (New Zealand) have played in the most prestigious concert venues and have won over 50 international accordion competitions. ArtSpring Presents: Philippe Sly and Michael McMahon | Sunday 4th | 7:30pm to 9:00pm | Artspring: 100 Jackson Avenue | $5-$30 | One of Canada’s most successful young baritones teams up with one of Canada’s most well respected and accomplished pianists for a performance of Franz Schubert’s deeply moving 1827 song cycle Die Winterreise (Winter’s Journey). A Love Story | November 10th to 25th | 10:00am to 4:00pm | Artspring: 100 Jackson Avenue | Twenty women explore telling love stories through a variety of art mediums including mosaics, collage, mixed media, up-cycling, paint, photography, and words. These will not be ordinary love stories as the artists share their love of paper, places, paint, laughter, and memories. Abattoir Birthday Bash | Saturday 10th | 5:30pm | Fulford Community Hall: 2591 Fulford-Ganges Road | $60 [tickets] | Save the date! Come out and support local food, vibrant community and sustainable farming. Dinner will be served, and of course there will be the famous birthday bash silent auction where you can bid on the services of local tradespeople, local produce, and many other things you have always wanted! Salt Spring Island Remembrance Day Ceremony | Sunday 11th | Parade: 10:30am & Ceremony: 10:45am | Centennial Park Cenotaph | Lest We Forget. Join veterans in Ganges to remember the sacrifices made by thousands of Canadians preceded by a parade mustering at the Post Office at 10:30am and followed by an open house at the Royal Canadian Legion Branch 92. Giant Book Sale + Jewels for Literacy Sale | Friday 17th - Sunday 19th | 10:00am to 4:00pm | Farmers Institute: 351 Rainbow Road | Support Salt Spring Literacy at the Island's famous annual Giant Book Sale where you can pick from thousands of books from philosophy, mystery, science fiction, romance to picture books and much more! Love books? Head over to Black Sheep Books, fine purveyors of vintage, nearly new and antiquarian books! This eclectic two story shop has earned its glowing global reviews with tall bookshelves crammed with great reads for even the pickiest book lover! Want more books? Take a short stroll to Salt Spring Books and get the newest best sellers, magazines and more! 6th Annual Harvest Abundance Circle Pantry Swap | Sunday 18th | 2:00pm to 5:00pm | Location: TBA | Bring your extra preserved goods to trade, share, and gift - fruit, herbs, medicine, mushrooms, fish, veggies, nuts, jam, pickles, kombucha, dry, frozen, fresh, or whatever you’ve harvested and/or made this season! Salt Spring Folk Club presents: Barney Bentall and the Cariboo Express | Monday 19th | 7:00pm | Fulford Hall: 2591 Fulford-Ganges Road | Don’t miss this fun-filled night co-hosted by Barney Bentall and Matt Masters, featuring a line up of Canada’s finest roots and country musicians benefiting Salt Spring Community Services. Salt Spring Concert Band: Tales of Old | Friday 30th | 7:30pm to 9:30pm | Artspring: 100 Jackson Avenue | $5-$20 | Tales of Old takes us on a mystical journey through long forgotten lands. Experience musical evocations of fantastic and familiar creatures – the unicorn, firebird, thunderbird and hawk. Travel through beautiful landscapes - lochs, mountains and a mysterious village. Join Salt Spring Concert Band on this journey of music and imagination. WinterFaire | Saturday 24th & Sunday 25th | 24th: 9:00am to 2:00pm; 25th: 11:00am to 12:00pm | Salt Spring Island United Church: 111 Hereford Avenue | A one stop Christmas shopping affair! Come and enjoy a Christmas Cafe featuring hot lunch of traditional Tourtiere (homemade bagels with salmon), music, shopping upstairs & down for handicrafts, Christmas & gluten free baking, frozen cuisine, jams, fruit cakes, silent auction, kids-only shopping area, and fishing pond! Fulford Hall Christmas Craft Fair | Friday 30th to Sunday 2nd | 1st: 5:00pm to 9:00pm; 2nd: 10:00am to 5:00pm; 3rd: 10:00am to 4:00pm | Fulford Hall: 2591 Fulford Ganges Road | Peruse the work of 55 artists from Salt Spring Island ranging from textiles, fibre arts, pottery, jewelry, chocolates, preserves, baked goods, ceramics, soaps, lotions, creams and more at the Fulford Hall Christmas Craft Fair! Beaver Point Hall Christmas Craft Fair | Friday 1st to Sunday 3rd | 1st: 5:00pm to 9:00pm; 2nd: 10:00am to 5:00pm; 3rd: 10:00am to 4:00pm | Beaver Point Hall: 1365 Beaver Point Road | Experience all Salt Spring has to offer under one roof at the Beaver Point Hall Christmas Craft Fair! Find everything from hand forged knives, fine jewellery, hand made pottery, fine woodworking, soaps and lotions and more! 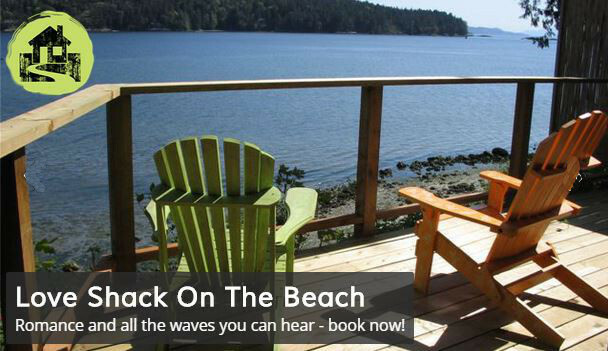 Find out why Salt Spring Island's nickname is the Mediterranean of Canada and escape the rain! Did you know during the rainy season Salt Spring Island gets half the precipitation as the mainland? Enjoy the cool fall weather, clear skies and grab a warm mug of coffee or hot chocolate from some of our amazing Island coffee stops such as TJ Beans, Barb's, Rock Salt, Cafe Talia, Fernwood Road Cafe or Kizmit Cafe - while you're enjoying a cup of cocoa and their unique atmospheres, be sure to enjoy art displays by local artists in a variety of mediums!